Golf swing. Baseball throw. Softball slide. Football punt. Swim stroke. 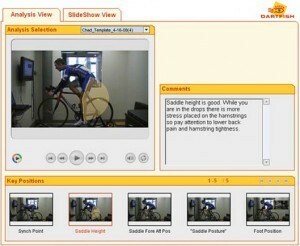 The list of sports mechanical processes that can be captured by Dartfish video analysis is endless. Coverage of sporting events often makes use of StroMotion™ captures of divers, volleyball and other sports for our entertainment. In the hands of Bon Secours In Motion’s trainers, Dartfish becomes a powerful tool for seeing weaknesses and demonstrating improvements. Bon Secours In Motion’s trained staff use Dartfish in combination with years of expertise and a wide array of sports training equipment to capture human motion at key points of a process. Athletes are videotaped to capture the way they swing, stride, etc. That footage is analyzed. After being instructed in proper technique, the athlete is videotaped a second time. The trainer produces a Mediabook for the athlete to take home that shows proper technique with instructive comments at key positions.